It’s what Marie Jones (not her real name) said a week before Thanksgiving. The 20-year-old client of Catholic Charities, wasn’t worrying about herself. Jones took on a world of responsibility after her mother died, working extra hours to provide for her younger siblings and to help pay off funeral costs of her now-deceased mother. She had reached out to Catholic Charities to find grief counseling for her brothers and sisters, knowing that they were struggling to process the loss. The help that Marie and her family received went well beyond her initial request. 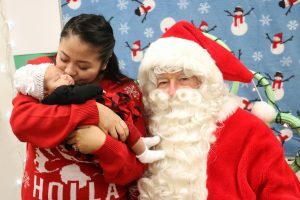 Catholic Charities in the Diocese of Camden is often a touchstone for those in the community with a generous spirit, particularly around the holidays. They trust the organization and its ability to minister to those who are truly “the poorest of the poor” in South Jersey. So when Jim Livengood of Blackwood reached out to Catholic Charities, offering to donate a Thanksgiving dinner to a needy family, Marie Jones and her siblings were a natural choice. Though the young woman was initially hesitant to accept the meal which included a ham, side dishes, desserts and other items, after accepting the gift she said, “I can’t explain how much that meant to us. I knew it was going to be hard without our mother this year, but [my siblings] loved helping prepare the meal, and especially helping to bake the cookies. It brought so much joy into our house and I couldn’t be more thankful. I thought I would only be able to afford a chicken for Thanksgiving dinner!” she laughed. When word spread to Mater Ecclesiae in Berlin of a family struggling to cope with the loss of their mother, and the valiant efforts of the oldest daughter — barely an adult herself — to keep her four siblings together, the church quickly added Marie’s family to its Christmas Giving Tree and provided a myriad of beautifully wrapped presents for all of the family members to be delivered by Christmas. Yet, through these challenging times, Catholic Charities works to bring dignity and joy to the thousands of clients the agency serves annually. This year, Samantha Astley, the agency’s volunteer coordinator, mobilized a group of staff and volunteers to host a Christmas party for clients, where families could come in to the decorated office, get a family picture taken with Santa, pick up some food to bring home, and help themselves to some warm donated winter clothing and other items. On Dec. 17, Astley also organized a toy giveaway for Catholic Charities clients, offering parents a chance to come in and pick out some toys for their children, items donated by parishes, volunteer groups, friends and staff of the agency. Thirty-six families (91 children) were served.